With the way the season had been going for the Carolina Panthers, the playoffs were probably not going to happen for them. But—you never know. Winning streaks happen, and if the right teams collapse down the stretch, there is a chance they could make it back to the postseason—a very slim one, but a chance nonetheless. For that chance to stay alive, the Panthers had to beat the Oakland Raiders. With the Raiders holding onto a 24-7 lead at the half, it didn’t look good for the Panthers. After Cam Newton’s three-yard touchdown run tied the game at 7-7 late in the first, the Raiders defense shut down the Panthers offense for the remainder of the half–but it got worse for the Panthers. 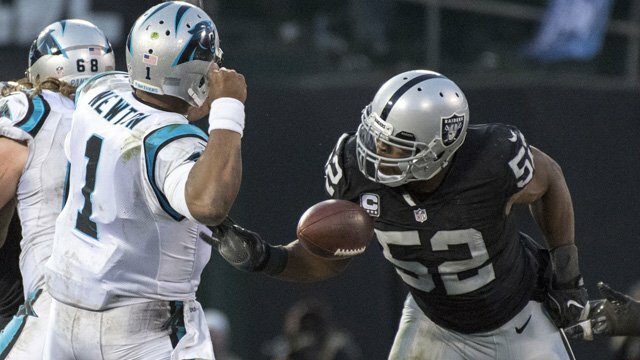 Khalil Mack topped off a dominant half by the Raiders defense by picking off Cam Newton and returning the ball six yards for a touchdown. If the Panthers were going to have a shot, they needed something to happen. Little did they know that something would be Raiders quarterback Derek Carr dislocating his pinkie early in the second half. 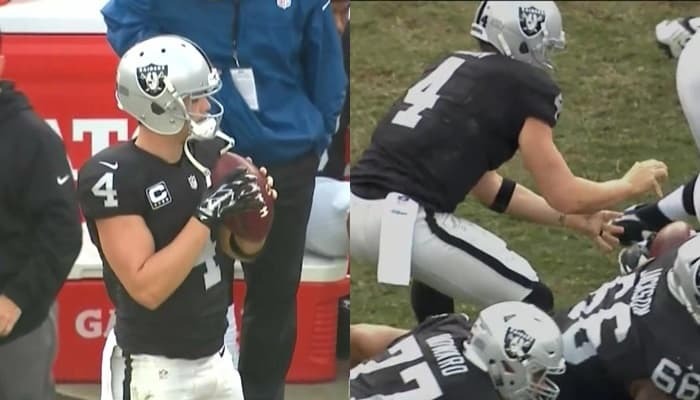 It appeared that Carr might have tried to pull away from the center a little too soon and with how the ball hit his finger, it dislocated. According to the on-field reporter, Carr was screaming in pain when he came off the field. He immediately ran back to the locker room to get it checked out. In the meantime, Carolina recovered the fumbled snap, and six plays later Jonathan Stewart crashed over the goal line from a yard out to make the score 24-13 ( the extra point was blocked). The Panthers would go on to score 25-unanswered points to take a 32-24 lead early in the fourth quarter. Derek Carr returned to the game after missing one drive with a glove on his injured hand but failed to get the offense moving until after the Panthers offense went on their mini-scoring rampage. But if Raider Nation has learned one thing the last couple of seasons, it is that you can’t ever count Derek Carr out. After Carolina had extended their lead out to eight, Carr got the offense moving on the Raiders next possession and back in the end zone with a 12-yard touchdown pass to Clive Walford. With the two-point conversion, the game was officially tied at 32-32. Another great effort from the defense forced the Panthers to put the ball back in Carr’s hands with 5:00 on the clock and 87-yards to go for a touchdown–but he couldn’t get the team back in the end zone. Carr got the offense as close as the Carolina five-yard line, but couldn’t punch it over and was forced to settle for a field goal and a 35-32 lead. While it was nice to have the lead again, there was still 1:45 on the clock—plenty of time for Cam Newton to work his magic. But the Raiders defense had beaten and battered Newton all day long (except for the third quarter) and came back alive in the fourth quarter long for Carr to get the team back on top. But all the Panthers needed was a field goal, and they had plenty of time to get in position for an attempt. After an 11-yard completion to Devin Funchess gave the Panthers first and ten from the Oakland 44 with 1:10 to play, it looked like they would at least get a chance to tie the game. 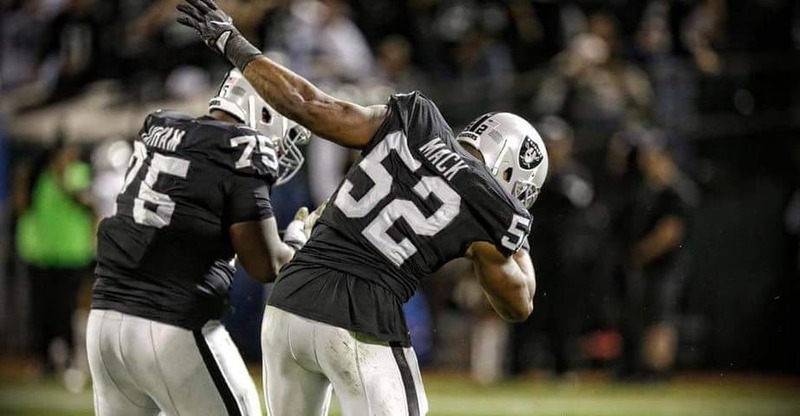 All they needed was one more first down to get within range—which Khalil Mack made sure they wouldn’t get it with a monster sack on fourth down. After the game, the Raiders said Carr’s finger had been x-rayed, and it was all right. They expect him to be just fine when he faces the Buffalo Bills next week. As for the Panthers, their playoff hopes are more than likely over at 4-7. There are too many teams in the AFC playing well for them to get a wild card spot without someone having an epic meltdown to end the season.